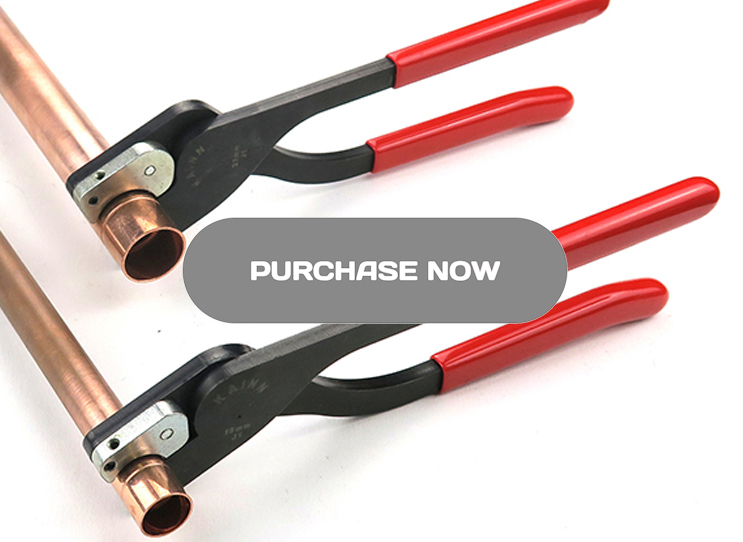 The Kainn Solder Fitting Crimping Tool has been developed by Karl and Andrew after years of frustrating pipework falling apart or dropping out of position during soldering. 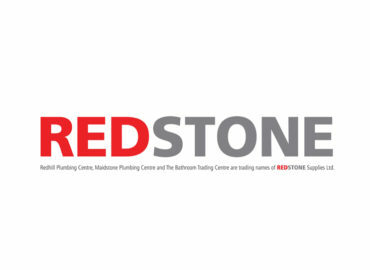 A common problem encountered by every plumber using standard copper pipe with end-feed or Yorkshire® fittings. Karl is a joiner and Andrew an electrician so basic plumbing is something they always tackle. As with most trades lots is learned on the job from the those who have had many year’s experience and one forgets more than one will ever know; when there is nobody to guide you, you keep doing the same thing you have always done. For many years their bread and butter work was the installation of kitchens and this always involved the installation of a sink. The first process before installation of new units was to alter the services to suit the new layout. For the hot and cold water this generally meant the existing pipes were run behind the base units along the wall and bought into the units by installing an elbow to the pipes to bring it off the wall at 90degrees and into the base unit, simple basic plumbing. The problem encountered almost every time was when the pipe is extended from the wall the weight of the protruding pipe would cause the joint to rotate out of position or even fall apart. This was even worse when one thought the fitting was tight enough to hold itself in position so one tries to solder without supporting the pipework. As heat is applied to the fitting it expands quicker than the pipe causing a larger gap between it and the pipe so just as one goes to apply the solder it rotates and falls on the floor so one has to re-clean and flux everything again. 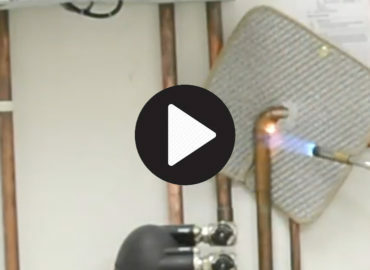 With the “average” plumber only having two hands this creates a problem; how do you manage to hold your soldering blowtorch and solder whilst holding pipework in the correct position? The usual solution is to use a third hand from anybody close by but if nobody is available it’s time to build a tower out of anything close at hand to support the pipe; this has included toolbox, flux tub, coil of solder, bricks, pieces of timber or even a sleeping dog! 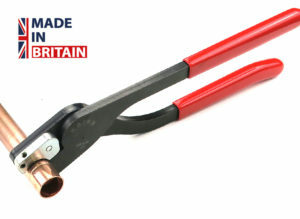 On one installation the gas fitter came to install the hob and he had the same issue, but his solution was to squash his fitting out of shape with a pair of water pump pliers to stop it rotating. He was slightly out of position and was unable to reposition his fitting without a bit of brute force. Karl and Andrew then starting to thinking of solutions of how to hold the pipes while it is being soldered without having to play Jenga® every time, maybe some kind of solder fitting crimping tool ? Andrew and Karl came back to Monument after Monument first asked for some product testing on the solder fitting crimping tool . 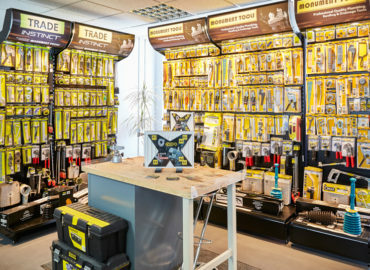 With the advent of Tooltalk within Expert Trades and the Monument Masters, Monument is trying to develop a quicker way of getting the products to market and also in front of the eyes of the, all important, installers. 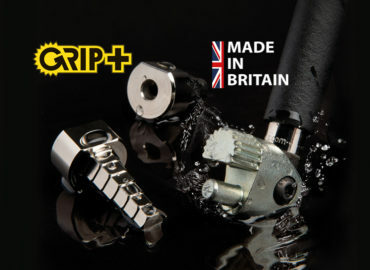 The reviews of the solder fitting crimping tools are below and you can buy the solder fitting crimping tool from the Monument website as part of the (re)launch of the product. Karl and Andrew’s first solution was to create a pipe clamp that fitted on one pipe to provide the support and an arm attachment that could be positioned to hold the second pipe while it is be soldered. But, while searching his grandfather’s shed for parts he came across an old package. His grandfather was a maintenance engineer for Ready Mixed Concrete and had many old tools. 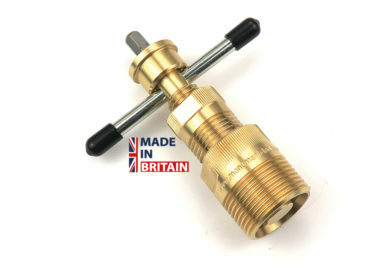 The package contained a clamp system which was basically the idea for the Solder Fitting Crimp Tool but on a bigger scale as it looked like it was more for steel pipes. 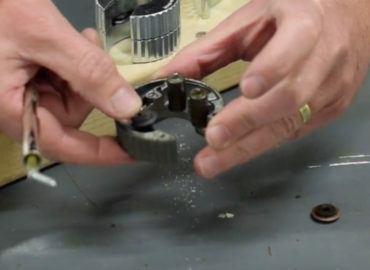 They tried the clamps and the solution worked but unfortunately although the idea was probably over 50 years old they could not get any form of patent protection for something that is already patented. They then started to think of the deformed pipe idea and came up with a solution which provide sufficient support without deforming the pipe. The most common type of joint used to join two sections of pipe is called a lap or capillary joint. The socket of the fitting has a larger internal diameter than the outer diameter of the pipe allowing one to overlap the other forming a space between the two sections, called a capillary space. This space is usually filled with a filler metal which is melted by either soldering or brazing adhering to the surfaces to solidly joint the two together. The problem is the capillary space has to be sufficient to allow the two sections to be assembled easily and to not too large to prevent the filler from adhering to the two surfaces. 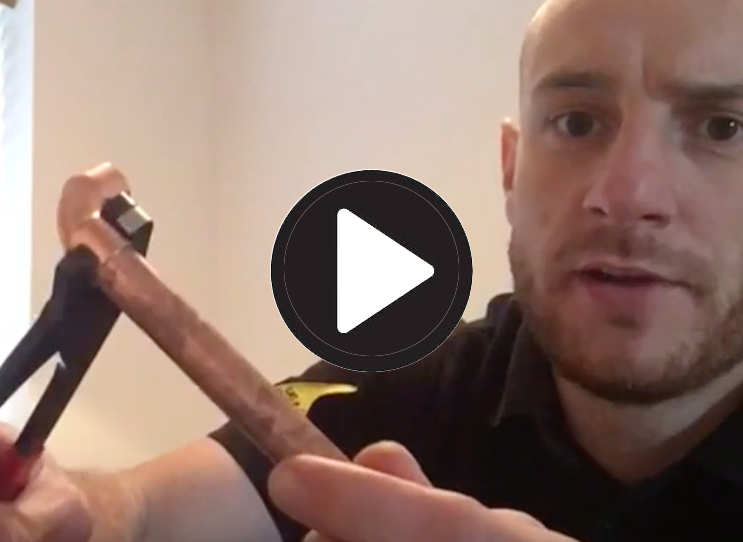 Their solution was simple, reduce the capillary space without reducing the capillary space. They therefore came up with the idea that the whole fitting does not have to be deformed to provide sufficient support only a small area. Version one image shows their first design of the solder fitting crimping tool which Karl put together from a pair of Rothenberger® pliers. He formed the two half round heads so it was the same size as a typical copper fitting and welded them to the head of the pliers. He then welded a small spike in the centre of the top head which provides the friction point. 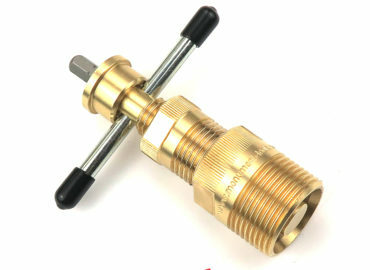 The concept was to indent the solder fitting creating a small friction point between the joint and the pipe which is sufficient to hold the two together without having additional support. The small indent was designed to give suitable grip to prevent movement of the joint plus enable the joint to be dismantle/repositioned pre soldering. The size of the indentation is significantly small to only effect a fraction of the surface area of the joint. 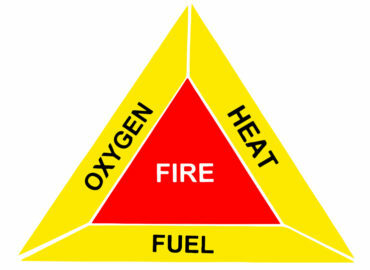 The concept worked in principle; the next step was to produce a design which could be replicated. 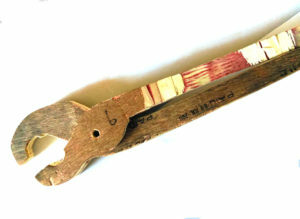 The plywood model is a design Karl made to try and solve the problem of joining the two handles together. 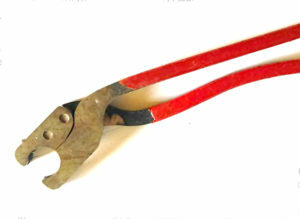 This led to the 3rd version of the solder fitting crimping tool which was designed on CAD and was cut by an uncle who works at an engineering company. This was the first process in trying to narrow down the actual design and manufacture process. 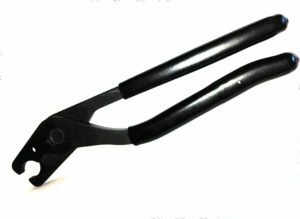 The pliers had a cone point grub screw inserted in the top which gave the solution on how to provide the device for creating the indentation. The pliers proved to be extremely heavy but provided the useful information regarding the design of the head and its restrictive use. From this basic design Andrew and Karl received help from Manufacturing Advisory Service MAS who put in contact with a patent attorney. They discussed the principle of the design of the solder fitting crimping tool and the chances of getting a patent. They went away from the meeting a bit deflated but started to think of ways they could design the pliers to allow some Intellectual Property protection. They learned the basics of Solidworks and started to design different versions of the pliers and created further prototypes before going back to see the attorney. 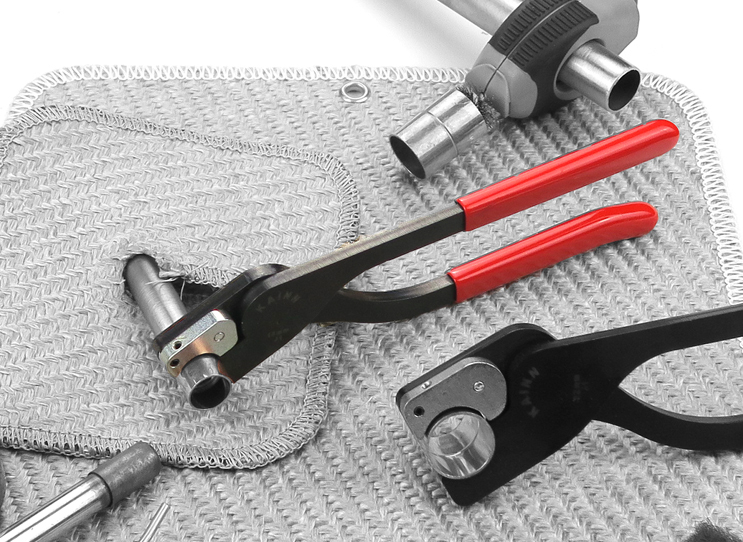 Version 7 of the solder fitting crimping tool was based on the new head design and also allowed for easy fabrication and assembly. 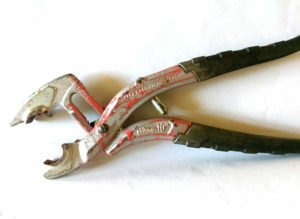 • The mouth of the head was left open to allow the pliers to slip over the joint without having to open the pliers too wide but provide sufficient support to hold the joint during crimping. This is beneficial when working in tight spaces. 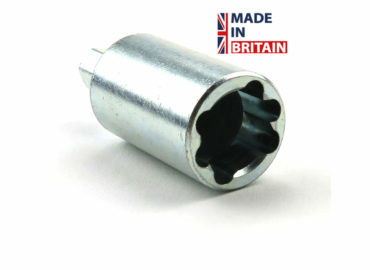 • The indentation pin is offset from the middle of the head to allow easier positioning when using Yorkshire® fittings. The initial feedback was good until they received the pliers back and discovered the handles had been bent out of shape. The handles had been designed too thin and with a bit of over exuberance by the plumbers this had caused the handles to deform. They were then at a stage where they wanted to obtain protection so they could try and get a return from their design. They supplied the relevant details to the patent attorney who put together three designs for application to cover them for the change in shape caused by different sizes. After a few months they received news that these had been approved and they had been granted three Registered Designs based on the pliers. The next process was to try and get these to market. Karl and Andrew had never had any experience in trying to promote a product. They searched the internet for help and also joined the Birmingham inventors club. 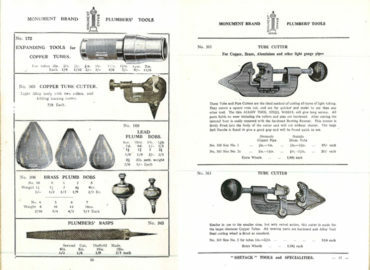 The club was good in getting some feedback but they struggled to find the information they required on how they should proceed in selling and marketing the pliers. 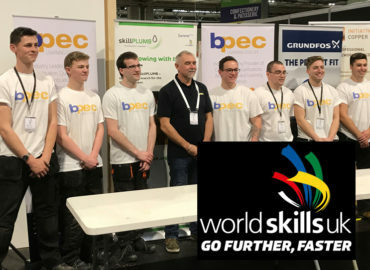 In the meantime they had a batch of components laser cut and started to manufacture the pliers but found it difficult to balance the need to produce the tool and earning a living. 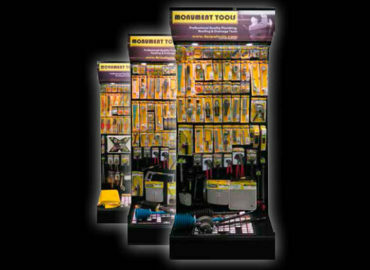 Work always took preference so nothing really happened until they approached local tool retailer. The retailer liked the design but required them to supply them at a price less than it was costing them to make the solder fitting crimping pliers. 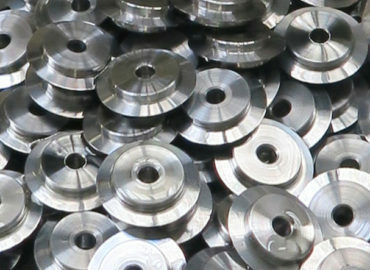 They then started to look for tool manufactures who could produce the tools. During the search they came across Monument Tools and thought they would approach them again. They had contacted them a few years before via their website but never received a reply so didn’t bother to pursue it. This time they spoke with them directly and a meeting was arrange to discuss the solder fitting crimping tool. The meeting was positive but unfortunately they were not interested without proof of prototype testing. Numerous phone calls were made to different manufactures but brought no joy in trying to get the tool ‘approved’ and the feedback they obtained pointed out that pipe-benders don’t have any form of approval but they are designed to deform pipes. They therefore didn’t bother to pursue ‘approval’ any further and went ahead and had a batch of pliers made. The difficulty they had was trying to get the pliers made at a price that they could sell them and make a profit. 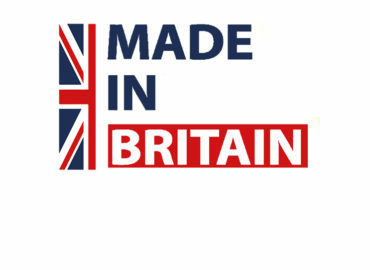 They wanted to keep the manufacturing in the UK #MadeInBritain but struggled to find a suitable manufacturer. They eventually came across one who was able to provide a finished product at a reasonable price but unfortunately they never got the impression they were interested in their business. The initial batch was full of manufacture flaws, which the manufacturers were not happy to rectify and basically ignored their concerns. This left Karl and Andrew in limbo until they went to a tool fair where we came across Monument tools again. They spoke with their Sales Account Manager and re-opened communications with Monument, third time lucky. 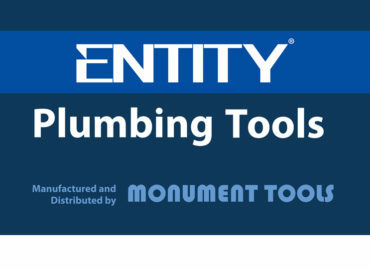 After a couple of meetings Monument took a few pairs and offered them to a select few plumbers via the Monument Masters. The feedback has been positive and currently Monument are in the process of marketing the tools. Only time will tell if the product is to be successful. 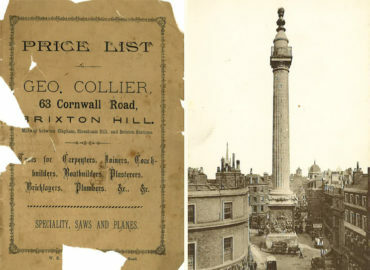 The product can be bought from the Monument website as part of the relaunch of the product.